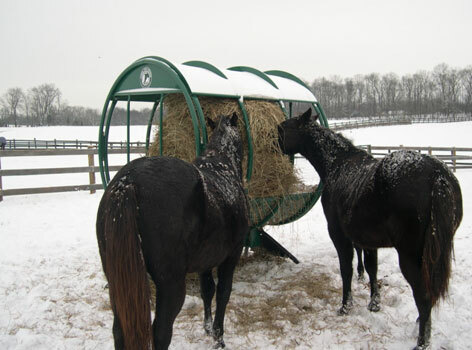 If you are in the market for a new hay feeder there is some information you should know first. This article will give you a quick overview of what you need to know. 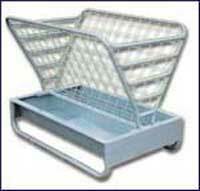 Hay feeders come in a wide assortment of shapes and sizes, and of course, prices. Along with not wanting to waste money on a hay feeder, you also don't want to waste money on the feed itself. Efficiency is important. When you pick a hay feeder, basically you are looking for ones that allows your livestock to feed safely while eliminating as much wasted hay as possible at the same time. 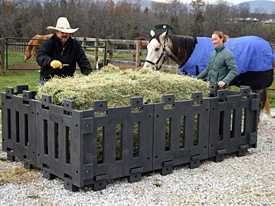 You'll want a sturdy and durable feeder, to maximize longevity as well, since hay feeders are pricey. 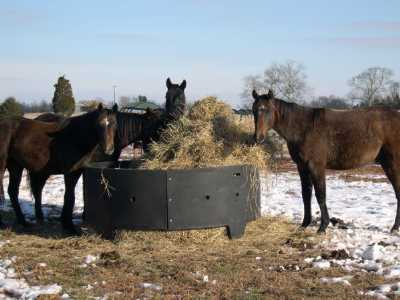 A quality hay feeder will minimize the amount of hay that is wasted on the ground, saving you money. Hay left on the ground will be quickly ruined in a variety of ways. Ground moisture, rain, snow, dirt, mud and animal waste mixes with the hay over a short period of time, rendering it useless. Dominant horses will sometimes mark their territory in any hay left directly on the ground. Other horses will take the opportunity to make a bed out of it and lie down. With all these factors, as much as 50% of your hay can be wasted in a matter of a few days, if not hours. What about round bale feeders? Do they solve this problem? Fact is, even hay in an open round bale feeder has a significant amount of waste. With this style feeder, your expensive hay is pulled out all over the surrounding ground. What's more, the hay on the bottom also rests right on the ground and can become wet and moldy. Once it becomes moldy, it is no longer edible and if the mold is bad, it can spread throughout the hay. If you have this type of open bottom ground feeder, we suggest making sure to use cone inserts. With a cone insert, the bale is suspended in a steel cone or via chains to eliminate any ground contact whatsoever. Air circulation through the bottom will keep hay dry, thereby reducing a substantial amount of waste that would otherwise be caused by mold and rot. Combining a cone feeder insert with a round bale feeder provides substantial savings and stretches out the hay supply. The insert keeps the hay in the feeder as cattle are eating and cuts hay loss to a minimum. PROBLEM: Enormous amount of hay LOST using the standard hay ring. SOLUTION: Other types of rack and elevated hay feeders provide proper air circulation as well. Closed bottom feeders can handle loose hay and silage. Covered or solid top feeders provide additional protection from rain and snow. Do you usually purchase round bales or square? You're probably already aware that round bales cost much less than square bales containing the same poundage of hay. Hay feeders that can accommodate these less expensive round bales can save up to 50%. Minimizing waste makes a hay feeder pay for itself rapidly. How do you choose the optimal hay feeder for your livestock and your operation? First, take into consideration the size of your animals. Most hay feeders come in different heights: tall for bulls and buffalo, shorter for smaller animals like sheep or calves. 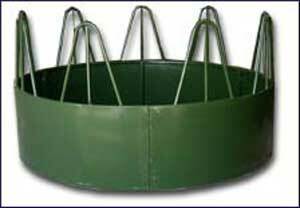 Many hay feeders come with a kick shield around the bottom. This is an important feature in that it limits feed waste and helps to keep calves out. Safety is the other important consideration when choosing a feeder. Slant bars are common on hay feeders as they make the animal "tip" its head to go in and out of the feeder. If the animal does drop the hay, it usually stays inside the feeder as they will have to tip/turn their head to get their head back out. Sheep and goats require a slightly different set up than cattle. Hay feeders are commonly combined with grain troughs for these much smaller animals. Feed bunks must be close to the ground for sheep and goats. Click here to see a full line of cattle hay feeders. When it comes to the round bale feeders available today, they are designed to minimize waste issues as noted above, but only for livestock. They are definitely not designed for horses and can even pose grave hazards because of the nature of these beasts. Horses are herd animals who rely on safety in numbers. The reason cattle bale feeders don't work for horses is because these animals are easily spooked. They startle and react with explosive force when surprised by noises, smells, strong winds or even other horses. Often a horse will rear or jump without looking. There is a danger that the horse will land on sharp edges or other ground-placed feeders. It has also happened that horses find themselves tangled in the feeders as they panic or try to avoid being kicked or bitten. Because horses naturally paw at their food, the height of the new round bale hay feeder helps protect their legs from possible injury. And since horses are grazing animals, what falls out of the feeder during feeding will be eaten first, leaving little waste. 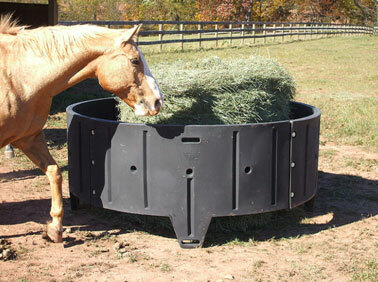 Corner stall feeders and floor feeders are designed to be efficient at keeping hay off the floor. This will minimizing waste and save you money. Look for products that are designed with no sharp edges that could injure your animals. These days you can purchase swing-out models that are particularly handy for feeding horses without them having to go inside the stall itself. A plastic hay feeder? Absolutely! The latest hay feeders made from rubber and plastic have eliminated many of the problems with the old metal ones. This new generation of hay feeder will not rust, rot, crack or break. Even better, it's possible to find some brands that have been made from recycled material and are UV resistant. 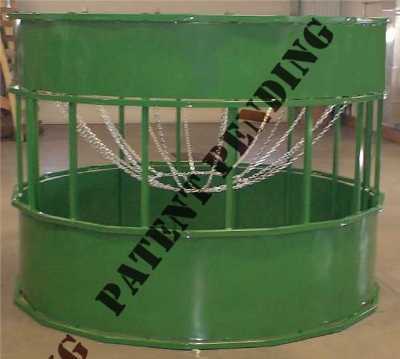 One of the main advantages of a plastic feeder is the fact that it is much more lightweight for moving, handling, and shipping. Although made of plastic, these feeders have been specially developed to be strong enough to withstand kicking. An innovation in hay feeders: New square panels are used to create custom sizes and shapes, including a floor to eliminate mold or rot issues. All plastic feeders that come in panels should have overlapping joints & countersunk fasteners. This gives them the sturdiness necessary for animal safety. These feeders are easy to assemble, handle, and move. making them very popular. Click here to see a full line of hay feeders. © 2004-2019 Information about hay feeders. All rights reserved.